Use cones to finish a multistrand piece. 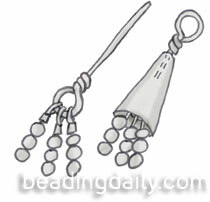 Attach each strand of beads to a wrapped loop or an eye pin. Use the wrapped-loop wire to string the wide end of a cone, covering the ends of the stringing material. Form a wrapped loop at the tip of the cone that attaches to a clasp.